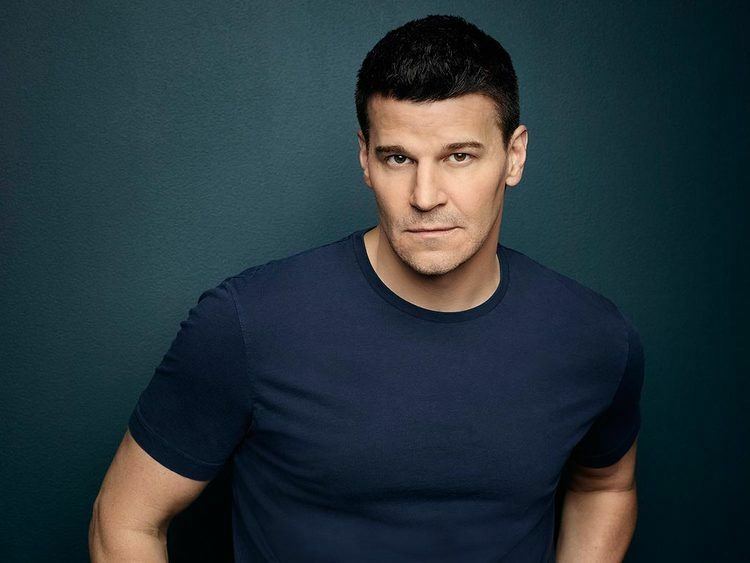 Born May 16, 1969 (age 46) (1969-05-16) Buffalo, New York, U.S.
David Boreanaz (pronounced , [boɾeˈaːnad͡z]; born May 16, 1969) is an American actor, television producer, and director, known for playing vampire-turned-private investigator Angel on Buffy the Vampire Slayer (1997–2003) and its spinoff Angel (1999–2004), and FBI Special Agent Seeley Booth on the television crime procedural comedy-drama series Bones (2005–2017). Boreanaz was born on May 16, 1969 in Buffalo, New York, where his father, Dave Roberts (né Boreanaz), was working as a weather forecaster and children's show ('Rocketship 7') host as Dave Thomas, for ABC affiliate WKBW-TV. His mother, Patti Boreanaz, was a travel agent. He has two older sisters, Bo and Beth. He is of Italian descent on his father's side (the surname Boreanaz is of Slovenian-Italian origin and was originally spelled "Berginc"). His mother is of half Slovenian and part Irish, German, French, and Swiss descent. When Boreanaz was seven years old, the family moved to the Philadelphia, Pennsylvania, area after his father took a job at WPVI-TV, the ABC affiliate in Philadelphia. 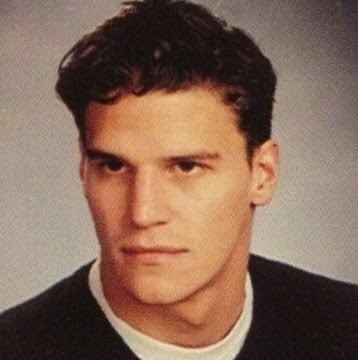 Boreanaz was raised Catholic and attended Rosemont School of the Holy Child at Rosemont, Pennsylvania and then high school at Malvern Preparatory School in Malvern, Pennsylvania. He graduated from Ithaca College in Ithaca, New York in 1991 with a degree in cinema and photography. While in high school he was a keen athlete and played on the school football team. Boreanaz moved to Los Angeles with a degree in film making, but found it hard to gain work initially like other struggling upstarts. Boreanaz slept on a couch which he shared at his sister's place, visiting film sets and doing production assistant work, in order to learn more about the industry he hoped to be more involved with. He was a background extra in the 1993 movie, Aspen Extreme as a fan waving at skiers. He also prepared props for Best of the Best II (also released in 1993), which stars Eric Roberts, where he also had a small uncredited role; Boreanaz is seen briefly standing to the left, as the characters Tommy Lee and Alex enter a nightclub (which is a front for an illegal fighting ring). Boreanaz's first paid acting appearance was a 1993 guest spot on the American sitcom, Married... with Children, as Kelly's unfaithful biker boyfriend, who gets pummeled by her father, Al. He was cast in the television series Buffy the Vampire Slayer, after being suggested for the role to Marti Noxon by one of Boreanaz's neighbors, after walking his dog past their house. In the cult series, he played the mysterious Angel, a vampire cursed by gypsies with a soul as punishment for his murdering a gypsy girl, initially resulting in debilitating remorse and then a life of contrition. The show became enormously successful and Boreanaz starred in a spin-off series, Angel, which gave the character a chance to evolve and concentrated on Angel's battle for redemption for the numerous murders he committed before he regained his soul. He appeared on Buffy from 1997 to 1999, at which point he began starring in Angel, which ran until 2004, with a recurring role on Buffy after his departure. He also appeared in the film Macabre Pair of Shorts where ironically he plays a Vampire's victim (in the segment "MPS"). Boreanaz's only starring role in a major theatrical film was in 2001's slasher horror film, Valentine, alongside Denise Richards and Katherine Heigl. In 2002, he had a supporting role in a Lifetime television movie titled I'm with Lucy. He was also to appear in the 2002 film Resident Evil as the main character, but turned down the role. In 2003, he appeared in the music video for singer Dido's hit single "White Flag", and was the voice of Leon (Squall Leonhart) in the video game Kingdom Hearts, but he did not reprise his role in the sequel. In 2005, Boreanaz began starring opposite Emily Deschanel on the current prime time television series, Bones. He also appeared in These Girls, a Canadian film in which he played a biker; the film received a limited theatrical release in Canada in March 2006, after premiering at the Toronto International Film Festival and the Vancouver International Film Festival. He has also starred in the independent films Mr. Fix It and Suffering Man's Charity (released on DVD as Ghost Writer), as well as the direct-to-DVD sequel The Crow: Wicked Prayer in which he starred alongside Tara Reid. In 2006, he starred in another DVD release, The Hard Easy, which also starred Steve Buscemi, Vera Farmiga and Nick Lachey. In that same year, he also voiced Hal Jordan in the direct to video DC Comics animated feature Justice League: The New Frontier. In the season three finale of his TV series Bones, Boreanaz's character Seeley Booth is seen in his bathtub reading an issue of Green Lantern, the character he voiced in that feature. As well as being a producer on Bones since its third season, Boreanaz also directed at least one episode every season since Season 4. BuddyTV ranked him No. 13 on its "TV's 100 Sexiest Men of 2010" list and No. 18 in 2011. In the 2011 movie The Mighty Macs, Boreanaz played the role of Ed T. Rush, NBA referee and husband of Immaculata basketball coach Cathy Rush. In 2013, Boreanaz starred in the miniseries Full Circle as Jace Cooper. The same year, Boreanaz starred in the independently made fantasy drama Officer Down as Detective Les Scanlon. Boreanaz has also appeared on American Dad! as Seeley Booth in the episode "Less Money, Mo' Problems", on Family Guy as himself in the episode "Road to the North Pole", and in the Baby Blues episode "Teddy-Cam" as the voice of Johnny. Boreanaz was married to Ingrid Quinn from 1997 to 1999. He wed actress Jaime Bergman on November 24, 2001. They have a son Jaden (Jaden Rayne Boreanaz, born May 1, 2002) and a daughter Bella (born Bardot Vita Boreanaz on August 31, 2009), whose name was later changed to Bella Vita Bardot Boreanaz. In 2004, Boreanaz underwent reconstructive surgery on the anterior cruciate ligament of his left knee, a result of a running injury he suffered in high school that was not fully corrected at that time. His recovery did not prevent Angel production from continuing, but did limit his mobility and physical activities in several episodes, including his directorial debut, "Soul Purpose". In 2010, Boreanaz, admitted to having an extramarital affair with Rachel Uchitel, one of the same women with whom Tiger Woods was alleged to have cheated on his wife. Shortly after Boreanaz's admission of the affair, text messages emerged on the Internet showing that indeed the affair was sexual in nature. At the time of Boreanaz's affair, his wife was pregnant. In 2013, Boreanaz, his wife and their friends Melissa and Aaron Ravo started the nail polish line Chrome Girl. The two wives run the day-to-day operations while their husbands help with the overall business. Boreanaz was involved with the creation of the NHL colors line and supports them publicly, Aaron, who works in advertising, has helped out with PR work and marketing. Boreanaz is a hockey fan and an avid supporter of the Philadelphia Flyers. Boreanaz has a friendship and strong working relationship with his Bones co-star Emily Deschanel.